The Moroccan city of Marrakesh is full to the brim with examples of captivating historical architecture. One of the most intriguing of these is the Saadian Tombs, located just outside the walls of the medina near the famous Koutoubia Mosque. Built during the reign of Sultan Ahmad el Mansour in the 16th century, the tombs are now a must-see attraction for visitors from all over the world. Ahmad el Mansour was the sixth and most famous Sultan of the Saadi Dynasty, presiding over Morocco from 1578 to 1603. His life and rule were defined by murder, intrigue, exile and war, and the profits of successful campaigns were used to construct fine buildings all over the city. 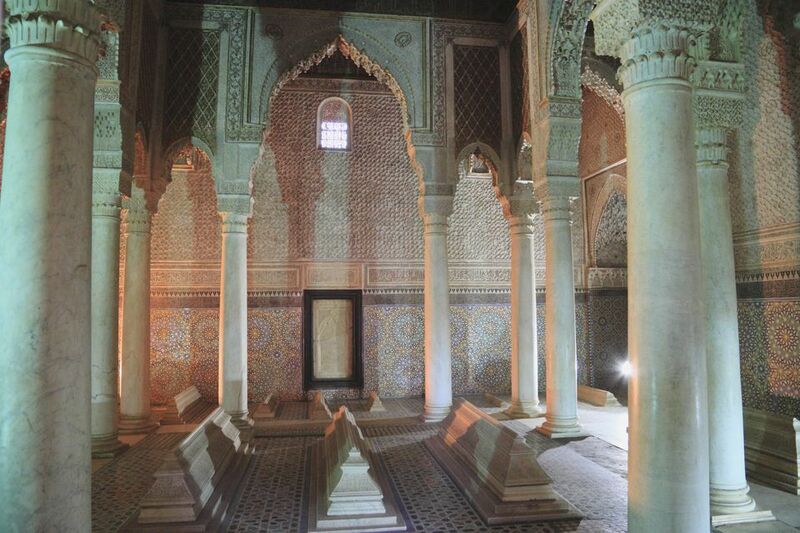 The Saadian Tombs were part of el Mansour’s legacy, completed in his lifetime to serve as a fitting burial ground for the Sultan and his descendants. El Mansour spared no expense, and by the time he was interred in 1603, the tombs had become a masterpiece of fine Moroccan craftwork and architecture. After el Mansour’s death, the tombs experienced a period of decline. In 1672, Alaouite Sultan Moulay Ismail ascended to power, and in an attempt to establish his own legacy, set about destroying the buildings and monuments commissioned during el Mansour’s era. Perhaps wary of incurring the wrath of his predecessors by desecrating their final resting place, Ismail did not raze the tombs to the ground, however. Instead, he walled up their doors, leaving only a narrow passageway located within the Koutoubia Mosque. Over time, the tombs, their inhabitants and the splendor within were erased from the city’s memory. The Saadian Tombs lay forgotten for over two hundred years, until an aerial survey ordered by French Resident-General Hubert Lyautey revealed their existence in 1917. Upon further inspection, Lyautey recognised the value of the tombs and began efforts to restore them to their former glory. Today, the tombs are open once more, allowing members of the public to witness firsthand what is left of the Saadi Dynasty. The complex is breathtaking in its design, with soaring domed ceilings, intricate wood carvings and imported marble statuary. Throughout the tombs, colorful tile mosaics and lattice-like plasterwork stand as a testament to the skill of 16th century artisans. There are two main mausoleums, together containing 66 tombs; while the rose-filled garden provides space for the graves of over 100 members of the royal household - including trusted advisors, soldiers and servants. These lesser graves are decorated with carved Islamic inscriptions. The first and most famous mausoleum is located on the left of the complex. It serves as the burial ground of el Mansour and his descendants, and the entry hall is dedicated to the marble tombs of several Saadian princes. In this section of the mausoleum, one can also find the tomb of Moulay Yazid, one of the few people to be buried in the Saadian Tombs after the rule of Moulay Ismail. Yazid was known as the Mad Sultan, and ruled for just two years between 1790 and 1792 - a period defined by devastating civil war. The highlight of the first mausoleum, however, is the opulent tomb of el Mansour himself. El Mansour lies separated from his descendants in a central chamber known as the Chamber of the Twelve Pillars. The pillars are carved from fine Carrara marble imported from Italy, while the decorative plasterwork is gilded with gold. The doors and screens of el Mansour’s tombs offer stunning examples of hand-carving, while the tile-work here is impeccable. The second, slightly older mausoleum contains the tomb of el Mansour’s mother, and that of his father, Mohammed ash Sheikh. Ash Sheikh is famous as the founder of the Saadi Dynasty, and for his murder at the hands of Ottoman soldiers during a conflict in 1557. The easiest way to reach the Saadian Tombs is to follow the Rue Bab Agnaou from Marrakesh’s famous medina marketplace, Djemaa el Fna. After a scenic 15 minute walk, the road leads you to the Koutoubia Mosque (also known as the Kasbah Mosque); and from there, there are clear signposts to the tombs themselves. The tombs are open daily from 9:00am - 5:00pm. Entrance costs 7 € (around $8), and visits can easily be combined with a tour of the adjacent El Badi Palace. The El Badi Palace was also built by el Mansour, and later stripped by Moulay Ismail.